A better calibration source with a diffuse aperture that provides even launch conditions into the fiber optic cable. This results in a stable spectrum and sharper lines. This Xenon source is ideal for calibrating spectrometers, specifically those operating in the NIR region. A long-life 5000-hour bulb ensures low maintenance. 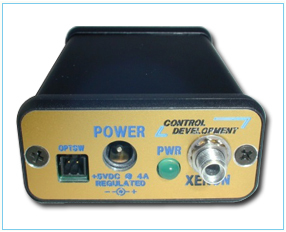 The Xenon source can be externally triggered which is a necessary feature for OEM system integrators. Call us for OEM packaging and pricing.